Little did I know when I went to visit my mom this weekend that she would have finished her living room! Go Mom! So today I get to show you the final reveal of her newly redecorated space. In case you missed last week, we started with the picture below: very gold and faux painted walls. Sorry the picture isn’t great. The living room is next to a red dining room/kitchen, and Mom still liked it. 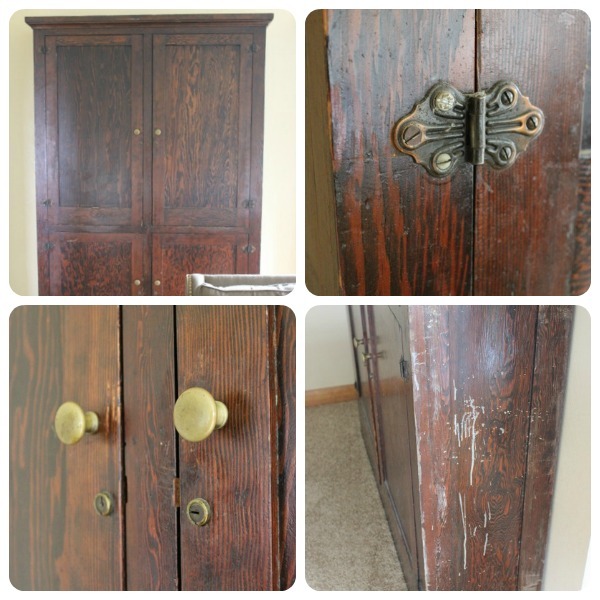 She also had a cherished cupboard she wanted to revive, from my grandma. 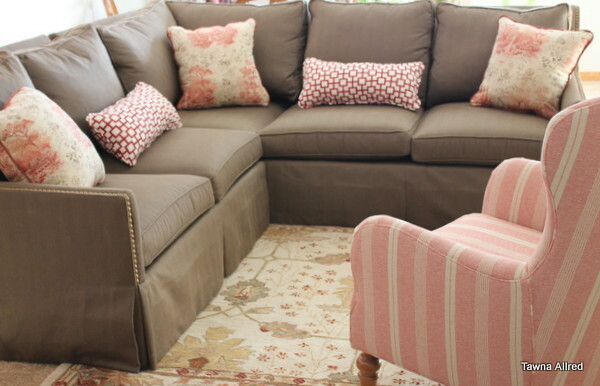 We installed a wonderful, family-friendly sofa from CR Laine in the center of the room. 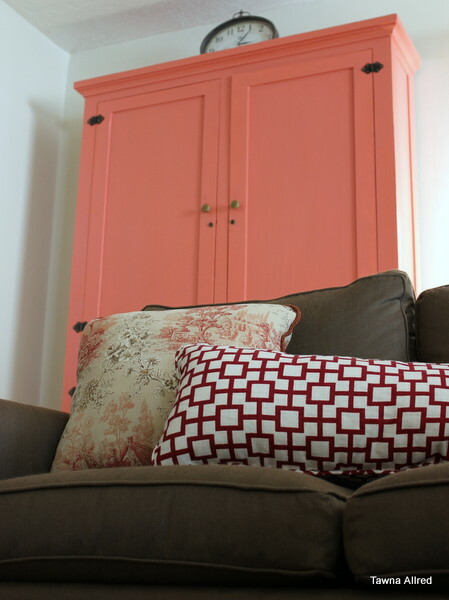 To keep things from becoming too red, we painted the cupboard a wonderful shade of coral. 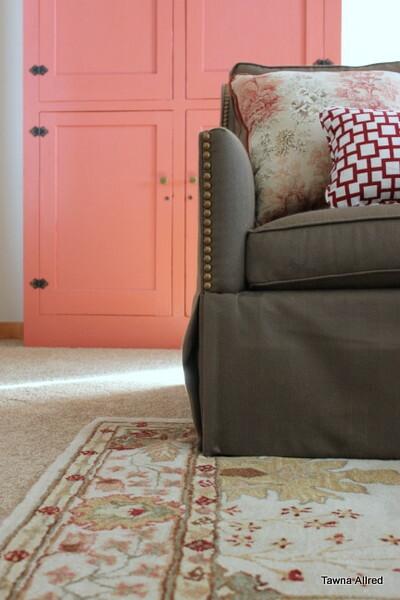 Then we did varying levels of red and coral through the rest of the room, all inspired by her new rug. 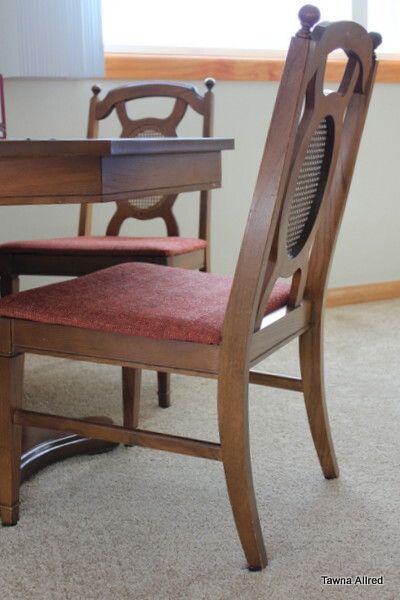 What you didn’t see was the final install of a custom chair and the re-upholstery of a dining room set (from her own mother) turned card table. Let’s walk you through everything, shall we? Here’s the best room shot I could get with my camera. 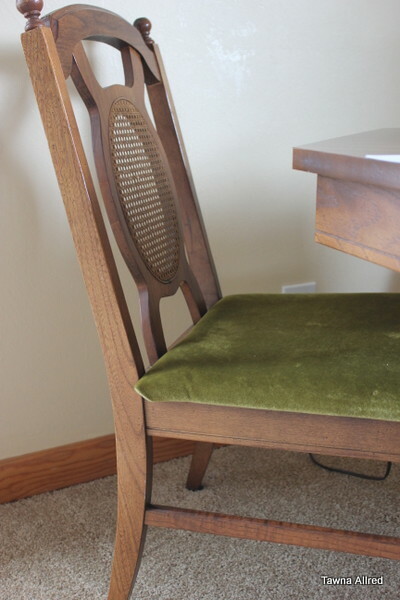 The dining-room-set-turned-card-table was upholstered in a wild shade of 70s green velvet. That couldn’t stay. We found some fabric via Fabric Guru for around $12 a yard, and it was in a durable poly/linen blend that can handle the toughest of grandchildren (that may or may not be my kids). 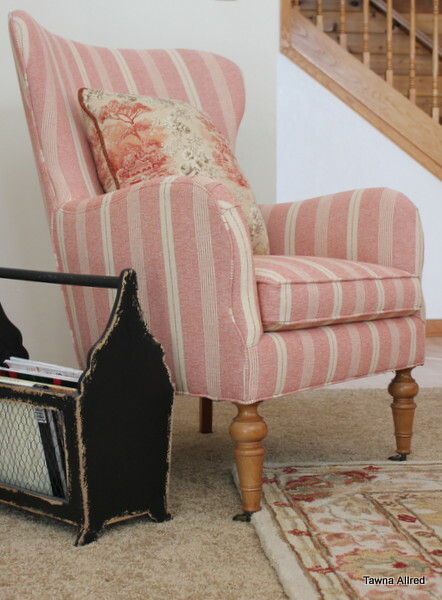 The Cullen chair from CR Laine is my favorite addition. 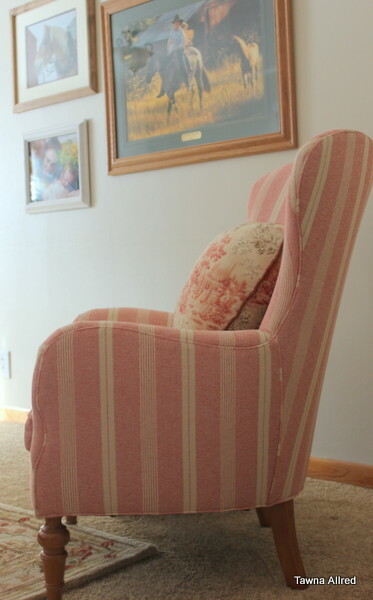 It has gorgeous lines, is fabulously hued yet humble, and is a chair you can fall asleep in because it’s so comfy. Want to know a fun budget-saving trick we used as well? My mom had some pictures she loved, but she didn’t want to re-frame them. She had splurged on the main pieces of the room (so worth it!) and wanted the rest of her investment to be low. However, her matting was not going to work. So what did we do? We spray painted the mats then put them all back together. And if you’re wondering about the wall color, it is Valspar’s “Walk in the Park”. My mom wanted a color that she could live with for a long time. You might have thought her walls were white as you’ve looked at these pictures, but look again. Do you see the contrast now, when the walls are in view of the white hallway? I love it. It’s so subtle and warm. 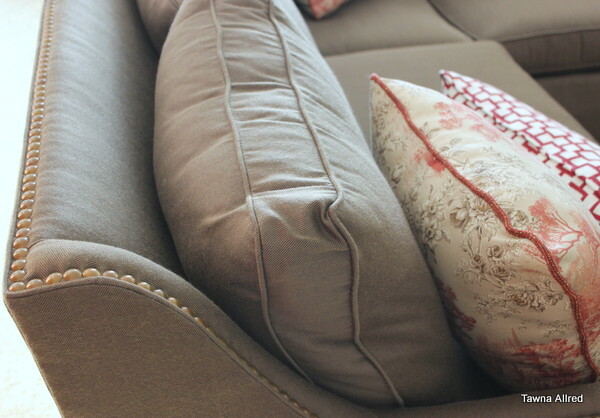 I hope you enjoyed this living room reveal! 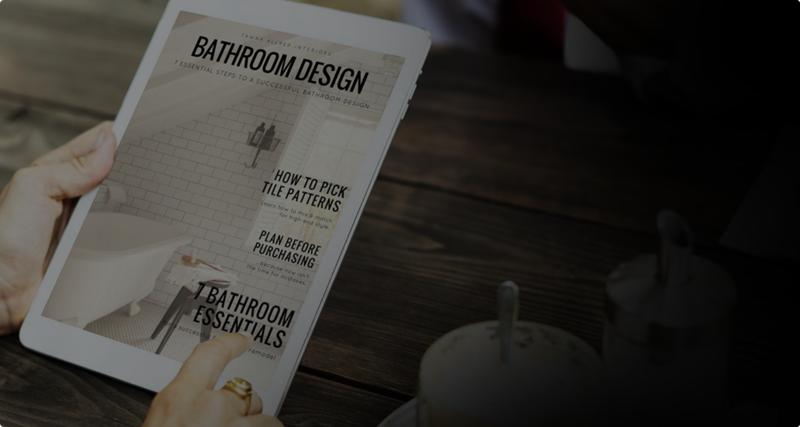 If I can help you create the home of your dreams, send me a message via my contact page. If you aren’t local, I have great online decorating services that reach anywhere in the United States. It’s also time to have another Master Class. This is the most affordable way to get one-on-one designer advice, along with new friendships and great food. I’ve scheduled one for March 22. I’d love to see you there!